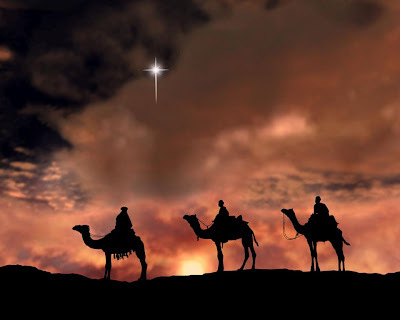 When I was just a little girl about five years old, I loved the Christmas carols “Oh Come all Ye Faithful”, “The First Noel” and “We Three Kings of Orient Are.” I sang them over and over again and they became a part of me, imprinted on my memory. 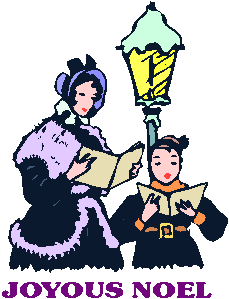 Now at Christmas time, it is still one of my favorite things to do to sing Christmas carols. Christmas doesn't feel like Christmas without singing those old time Christmas stories put to music. During our “Prayer Watch” on Friday night the seven of us women were wondering what Noel really meant and so we looked it up. It is a word for the Christmas season of joy and runs from December 24 to January 6th. So we decided to keep on celebrating this year and hold onto the joys of Christmas time and to me that means to keep singing! The Wise Men arrived after Jesus was born, so “We Three Kings” is a perfect song to sing for a joyous Noel. Every year I like to think of something homemade to give for special gifts for friends and family. This year I made up booklets of Christmas carols with my top ten favorites. How handy to give them out just in time to do some singing! Usually people oblige me a few songs. Personally, I’d like to sing for a couple of hours! Hahaha! Reading my Bible one morning I decided to read about the star the wise men followed. This one verse popped out to me. “When the wise men saw the star, they were thrilled with ecstatic joy.” (See Matthew 2:10 Amplified.) 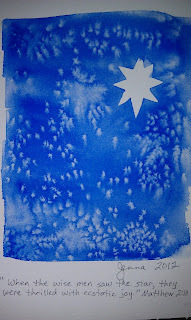 I decided to paint beautiful blue skies full of salt stars, but to mask off a bit of sky using masking tape cut into the shape of the special star the wise men followed. I think that was the hardest part—cutting out those stars on the sticky tape! At the bottom of each painting I wrote out the verse. What a great gift and Christmas card in one! 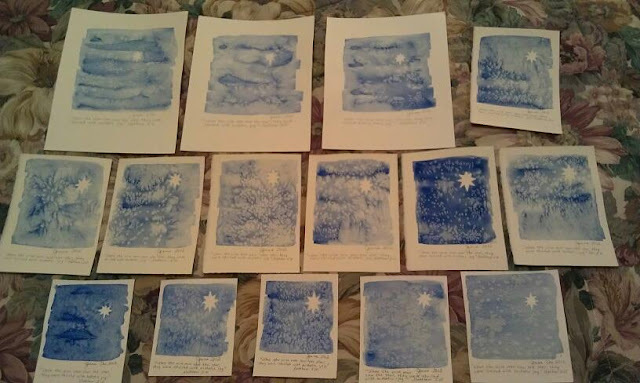 I started out with small three by five inch paintings, and as I gained in confidence I cut a bigger piece of watercolor paper to do four by six inch paintings. Then I got brave and did a few five by sevens. The technique is done with sprinkling salt. You paint the area with water, then add a few strokes of paint and wait until it is almost dry and quickly sprinkle on the salt very lightly—almost a grain at a time. There is this magical chemical reaction before your very eyes as the salt absorbs the pigment/color of the paint and makes a crystalline pattern—like snow or a starry night! You wait until the watercolor paper is completely dry, then wipe off the salt. It is amazing how each one comes out differently. SO fun! I used every bit of watercolor paper I had, and almost all my midnight blue paint, because I didn’t want to stop. I got so absorbed in my project I stayed up until two in the morning painting! The theme for Kingdom Bloggers this week is a favorite Christmas memory—my painting is one of them. Hahaha! I guess it shows I love my life, I’m enjoying the present, and living in the “now”. Have A JOYOUS NOEL everyone!!! Thank You for sharing your art, your story, and your love of Christ with us Jenna. ou are indeed an amazing servant whose life show wha the real "Peace of Christ" is about.